Wild Oceans’ Blue Crew (Hawukile Mbhele, Zameka Miya and Bonani Mngoma) sifts sand for nurdles at Durban’s North Beach. Wild Oceans is excited to be taking part in what will see more than a thousand people spanning 6 continents joining in on a worldwide search for tiny plastic pellets (nurdles) in the first Great Nurdle Hunt taking place from the 8th till the 17th of February. The hunt is taking place on 6 continents in over 16 countries, with more than 60 organisations and 170 individual events taking place. 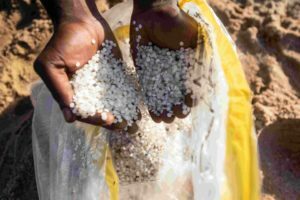 In October 2017 Durban experienced a catastrophic storm leading to a container ship in Durban Harbour being damaged and an estimated 49 tons of little plastic pellets, known as nurdles, leaking into the ocean and ultimately onto KZN beaches. This spurred the Wild Oceans Blue Crew, the South African Association for Marine Biological Research (SAAMBR), the Department of Environmental Affairs (DEA), the KZN Waste Network, DRIZIT, CoastKZN, various other NGO’s and the public into action. Nurdle Bins were also placed at most beaches along the KZN coast, where collected nurdles could be safely discarded by the public. 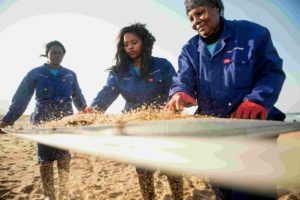 To date, an estimated 28 933 tons of nurdles (including both cleaned and unsorted nurdle debris collected by DRIZIT) have been cleaned off South African beaches over the last year since the spill, which still leaves 20 tons out at sea. 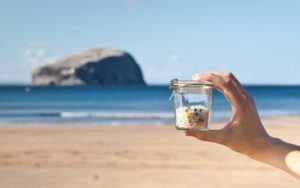 On Friday 8th February environmental charity based in Scotland ‘Fidra’ launches the first Great Nurdle Hunt, an international beach survey to illustrate the global extent of a little-known form of microplastic pollution, nurdles. Anyone can take part by searching for nurdles (plastic pellets) on their local beach and logging their nurdle finds at www.nurdlehunt.org.uk. So far over 170 individual nurdle hunts are due to take place in more than 16 countries with support from over 60 organisations as part of this worldwide data collection event. 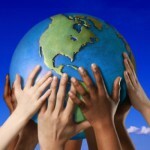 Nurdles are small plastic pellets, melted down to make almost all our plastic products. 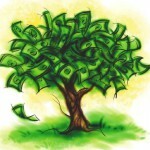 They are easily spilled and can be lost to the environment if not handled carefully. Once in the environment they are hard to remove and can absorb toxins present in the water. Easily mistaken for food by many animals, nurdles and their toxins enter the food chain daily. Last year, volunteers on a nurdle hunt removed 450,000 plastic pellets from just one beach in Scotland. 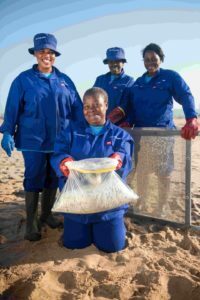 Wild Oceans’ Blue Crew (left to right) Duduzile Cele, Sarah Ntuli, Hawukile Mbhele (front) Duduzile Magubane hold their nurdle bounty. From 8th – 17th February Fidra are inviting people to take part in The Great Nurdle Hunt, collating data on pellet pollution worldwide. Nurdles collected by Wild Oceans’ Blue Crew using their custom-made sieve. “The hope is that if we show our support more people across the world to take part in Nurdle Hunts and help collect this valuable data,” concluded Kramer of Wild Oceans. If you are in Durban and plan to go to the beach and take part in the nurdle hunt, nurdles can be dropped off in a sealed bag labelled with the date of collection and the beach where the nurdles were collected at SAAMBR at UShaka Marine World.